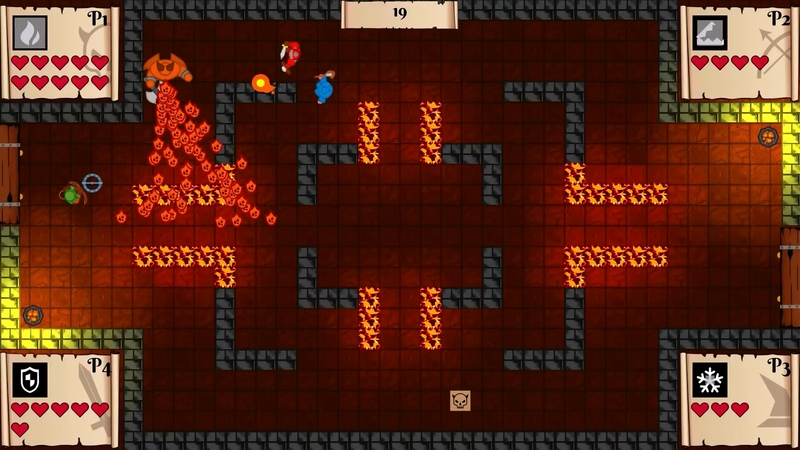 Party Vs Boss is a 4 players local multiplayer game, in which 3 players have to team up and fight in a dungeon battle arena in order to defeat the other player. Each game a different strategy! 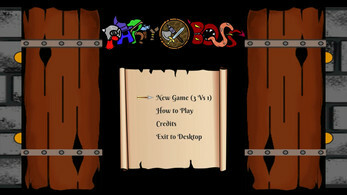 In each match, one player is chosen at random to be The Boss, while the other three players have to choose one of the three available character and form a Party of adventurers. 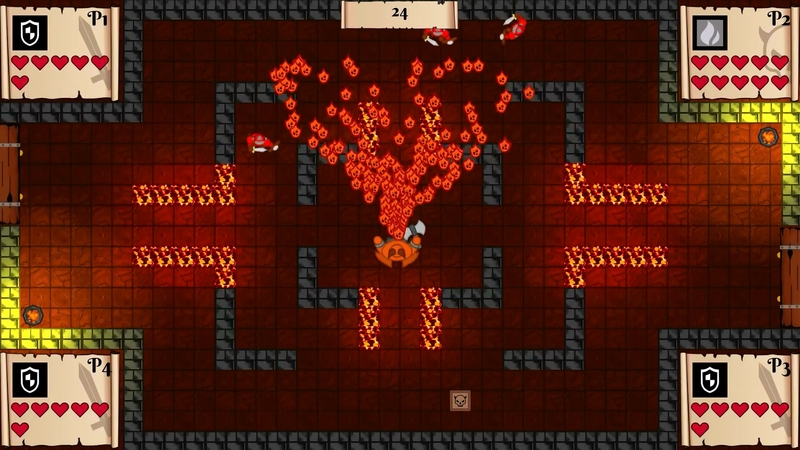 The Boss is more powerfull than the others characters, and to succeed the Party of adventurers must cooperate and find a strategy to defeat the Boss. There are several combinations of characters, which involve different strategies to overcome the powerfull Boss. The player who play the Boss is alone against three, but his character is way more powerfull than the others: moreover, he can use the traps in the dungeons to crush his opponents. Every character has two different blow: one standard attack and one special skill that has a cooldown.In order to survive, you have to use the special skill wisely. Warrior: good health, good speed, perform a sword slash as standard attack,stun the enemy as special skill. Hunter: medium health, great speed, throw arrows as standard attack, leave traps on the ground as special skill. Mage: low health, low speed. Cast fireball that pass through walls as standard blow, cast a ice bolt that slow down the enemy as special skill. The Boss: great health, great speed: Axe Slash as standard attack, perform a devastating fire breath as special skill. Use the environment at your advantage! The Dungeon is an ally of the Boss: in every room, there is a trap that can be activated by the Boss. If the Boss leaves the room and goes through one of the door that leads to another section of the Dungeon, the Party must follow him quickly, or they will die! In the next room, there will be a new trap usable by the Boss. In every room there are lava river: be carefull not to pass over them, or you will get burnt (unless you are the Boss, because you are awesome and you don't mind some small burn, don't you?). Each room is designed to favor one type of character with respect to another: be wise, and cooperate! The effect of the traps is random, most of the time the Boss benefits from it, but not always! Explosive Minion: Two summoned kamikaze-minion who will try to blow themselves away against an adventurers. 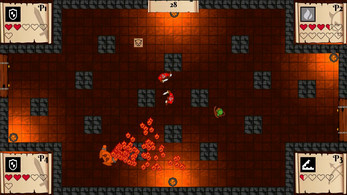 Each of the traps has a negative counterpart which favor the Party (Boss, be carefull of that damned communists minions! they want your head!). Endless fun with your friends! 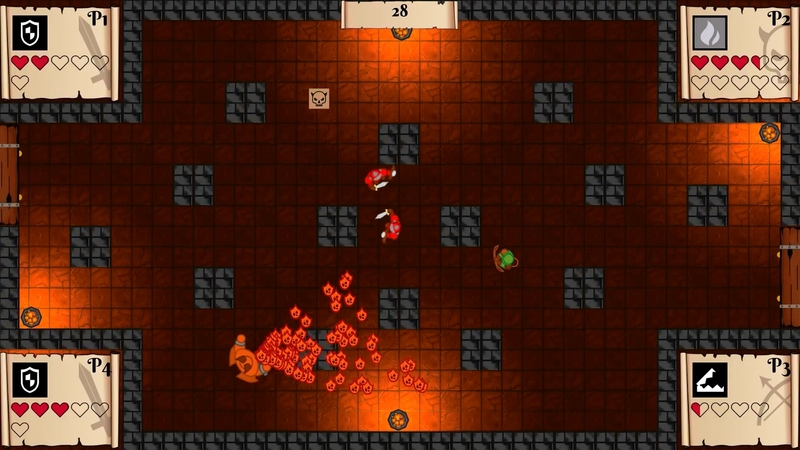 Party Vs Boss is designed to be played with 3 other players, each with his controller. To play the game, you will need 4 joypad/ controller. 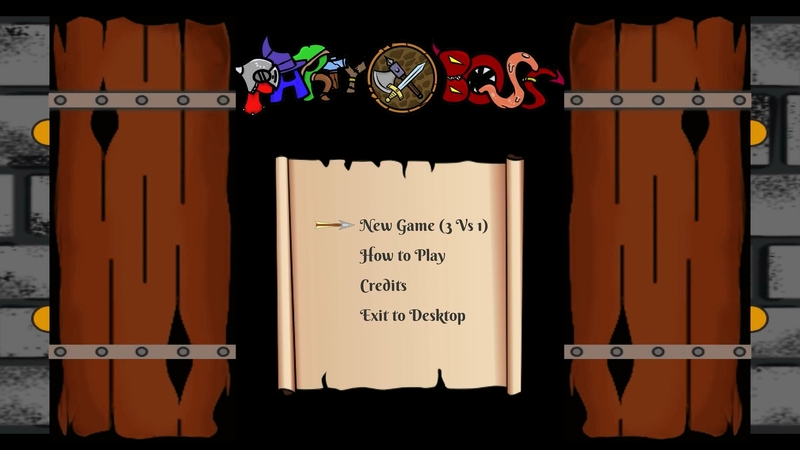 Just download, unzip, and play with your friends! Enjoy!